Cement courts, plexipave courts, greenset courts and similar phrases are all terms used in the tennis world to describe acrylic tennis court systems. Originally developed in the USA, this type of product has now found its way into the tennis market on a worldwide scale. However, these acrylic-based systems are not without their challenges – cracking, shrinkage and life expectancy are common problems with this type of product. They are slow draining. However, this surface type is still very popular for club and competition use and that is why En-Tout-Cas has introduced a range of ‘acrylic style’ tennis surfaces – but based on polyurethane technology. The Matchplay range of products feature hard court, semi-cushioned (Deluxe) and full cushioned (Deluxe Pro) systems that are suitable for indoor and outdoor installations. Our Matchplay court club system is the entry-level product (a hard court design) with no cushion layer, which is suitable for installation on to a non-porous sub-base. It provides users with the surface appearance of an ‘acrylic style’ tennis court, but with the improved technology in the system make up. The cross linking of the polymers during the mixing and application process provides levels of durability that surpass traditional hard court products. This improves the overall life expectancy of the court installation and alleviates the cracking and shrinkage problems normally associated with this product style. The completed installation has a seamless finish and provides good levels of traction underfoot in wet and dry conditions. Our Matchplay Deluxe court competition system is a ‘semi-cushioned’ system that provides an improved feel underfoot in terms of comfort level whilst still providing all of the advantages of the polyurethane technology used in the system make up. Matchplay is suitable for club and competition use both indoors and outdoors. 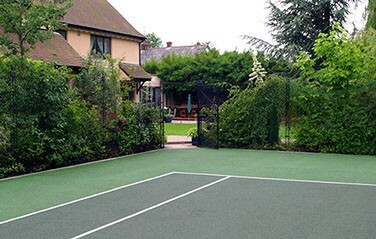 Our flagship product is our Matchplay Deluxe Pro court system which has been developed as a full-cushioned system (from between 4mm to a 7mm shockpad system) which is installed directly onto the non-porous sub-base prior to the application of the sealer coat and flow coat surfacing system. This product is recognised by the ITF and has been classified as a medium fast court in accordance with the ITF performance standards. The full Matchplay product range is non-porous and easy to maintain and clean. The courts provide consistent levels of performance both for the professional, club and recreational player. The high-quality UV-resistance package contained in the surface coatings make it suitable to be used for non-sports activities such as exhibitions and speech days without the need for additional surface protection. Drawbacks: Matchplay may sit wet for a considerable time in the winter when installed outside in the UK. Ideally it should be installed under cover. Please be aware that, as with all sealed courts, the Matchplay surface laid outdoors will need to be mopped of water after rain. At the end of its life-cycle, the installation can be quickly and easily re-surfaced without the need to replace the complete system.